West Roxbury and Braintree, MA (December 17, 2018) – Peabody Properties’ Oak Row Apartment community residents and staff recently welcomed City of Boston Mayor Martin J. Walsh as he toured the new community located in West Roxbury at 1235 VFW Parkway. 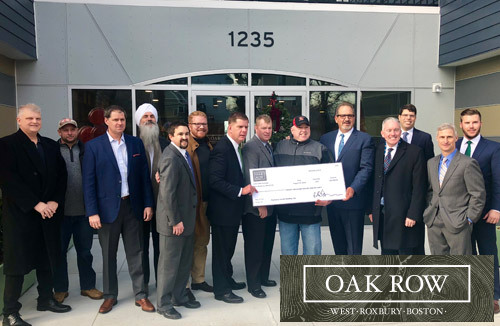 Additionally, developers of Oak Row Apartments presented nearby neighbors, West Roxbury’s Parkway Youth Hockey League, a check for $20,000 as a demonstration of their support. Located in West Roxbury, a community most recently noted as one of the 10 best neighborhoods for retirement by CNBC, Oak Row has transformed the long-time vacant, former International House of Pancake’s Property into 80 luxury apartment homes consisting of a mix of one-, two- and three-bedroom units. This four-story luxury community was designed by award-winning architects Khalsa Design Inc. of Somerville and constructed by Dellbrook|JKS of Quincy; the interiors were created by the award-winning interiors group at The Architectural Team of Chelsea. EA Fish Development, LLC of Wellesley, along with its investment partner Luzern Associates of Greenwich, worked jointly with the Davos Family to complete this transformative community. Oak Row is professionally managed and marketed by Peabody Properties, Inc., a full-serve real estate and property management firm. The community is expected to attract a wide-range of residents, from empty nesters to on-the-go professionals and young families. The community is LEED certifiable with project sustainable features that include energy-efficient appliances and fixtures and an environmentally conscious design. Building features include garage parking, several electric vehicle charging stations, pet wash and grooming station, private balconies/terraces, clubroom with kitchen and terrace, private work pods, work lounge and conference room, game lounge, package concierge, multi-functional wellness center and state-of-the-art cardio theatre, kids’ space, community deck, and Wi-Fi in all community areas. Oak Row features diverse apartment layouts and amenities that include kitchens with sleek custom cabinetry, quartz countertops, tile backsplash, stainless steel appliances, porcelain tile baths and showers, plank wood-style flooring, in-unit washer and dryer and LED lighting.